The middle photo above shows a PAST Trainer being loaded onto a freight truck, and another freight truck behind it waiting its turn to be loaded. 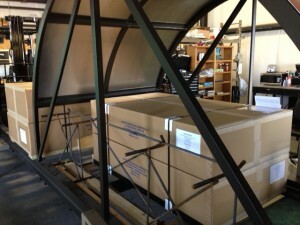 The other two photos show the PAST Trainer prepared for shipment. 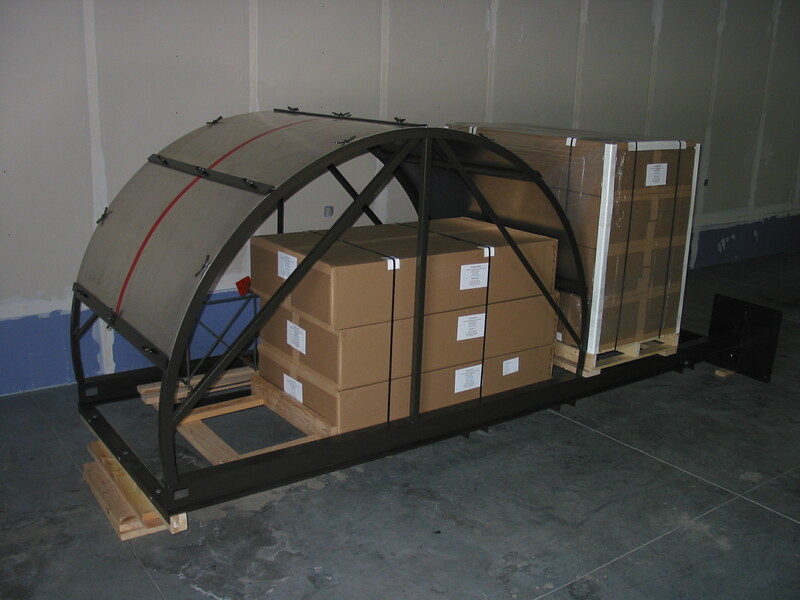 The photo on the right shows a Trainer ready for shipment configured with two sets of panels (two boxes of four panels each) and a Foundation Anchor System secured to a temporary wooden platform we construct specifically for shipments. We package four panels per set, which is a full covering of the curved High Reach Extendable Turret (HRET) penetration grid. 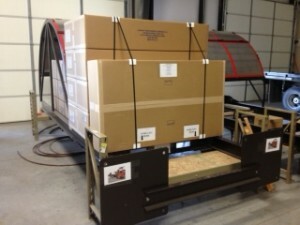 Each set of panels is packaged in a heavy-duty cardboard box for shipment. The panels are placed in each box separated by pieces of Polystyrene specifically shaped and positioned to provide maximum support and protection during shipment, and also to enable the enclosed panels to maintain their curvature during shipment and storage so they are ready to be mounted on the penetration grid when ready for HRET Penetration training. The first photo on the left below shows the Packing List, which we attach to a box of panels facing towards the base of the PAST Trainer. Some times, depending on the circumstances, we include the Packing List with the Owner Documents we email to the buyer. The Owner Documents are described in the web site home page. The photo on the right below shows a Trainer loaded with four boxes of panels–two loaded fore and two aft–for a balanced load. 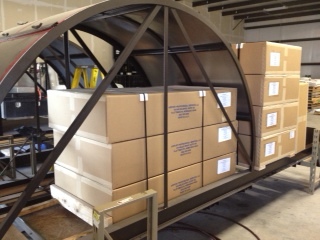 Sometimes we load four boxes stacked four high on the base of the Trainer. Third photo below shows the forklift tines engaging the forklift attachment in the base of the Trainer. 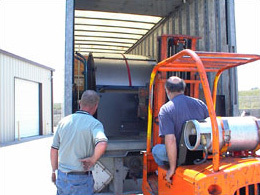 The fourth photo below shows a heavy-duty forklift approaching a Trainer for loading. 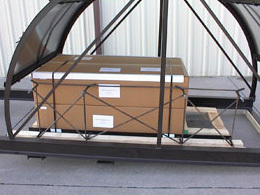 Buyers of PAST Trainers must have a minimum of a 6,000 pound forklift on hand to safely and securely download their Trainer upon delivery. We include a small cardboard box that we call the Hardware Kit, which contains the mounting hardware (anchors, washers, and bolts). 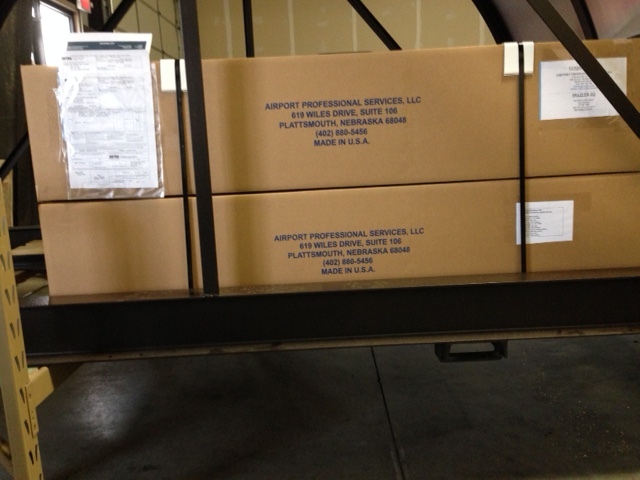 We usually store the Hardware Kit in the top box of panels, regardless of the number of boxes. The box with the Hardware Kit is always marked as such for easy identification. We can ship as many as eight sets of spare panels in one shipment, thereby providing savings to the buyer because up to eight spare panels can be shipped without any increase in the shipping and handling price. The reason for this is we secure all of the optional equipment to the temporary wooden platform between the PAST Trainer’s I-Beams. In so doing we do not increase the volume of space our shipments occupy on the freight truck. Similarly, ordering multiple sets of replacement panels provides a savings because, for instance, ordering four sets at one time is much more cost effective than ordering one set on four separate occasions. 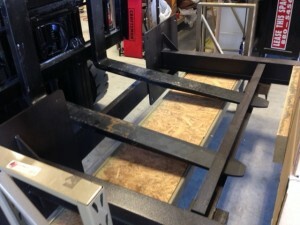 For additional protection during shipment of spare and replacement panels, we construct heavy-duty wooden pallets on which we secure the boxes of panels. 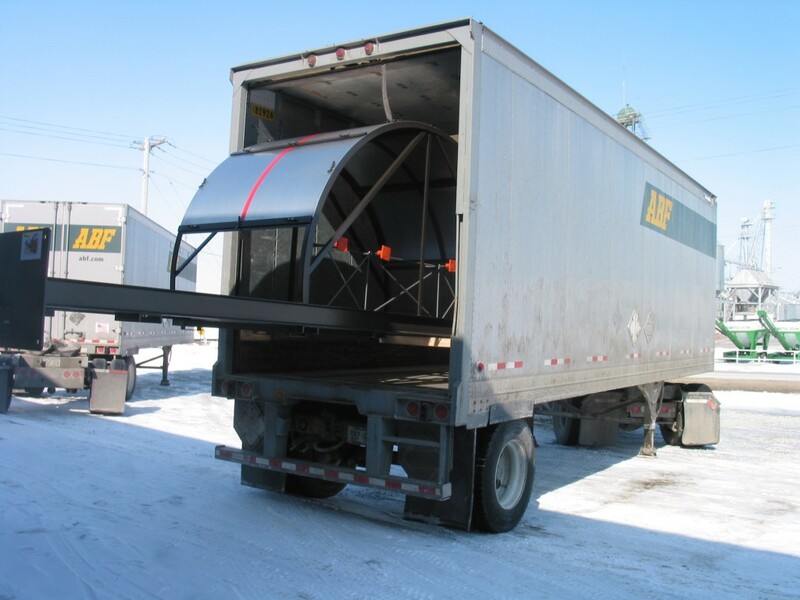 The photos below show a Trainer being loaded onto a freight trailer, and other freight trucks being loaded or waiting to be loaded with a Trainer for shipment and delivery. When we ship the PAST Trainer to overseas locations it is necessary for us to secure it in a container both for ocean freight and airfreight shipments. For airfreight, the shipment must be totally enclosed in a wooden crate. 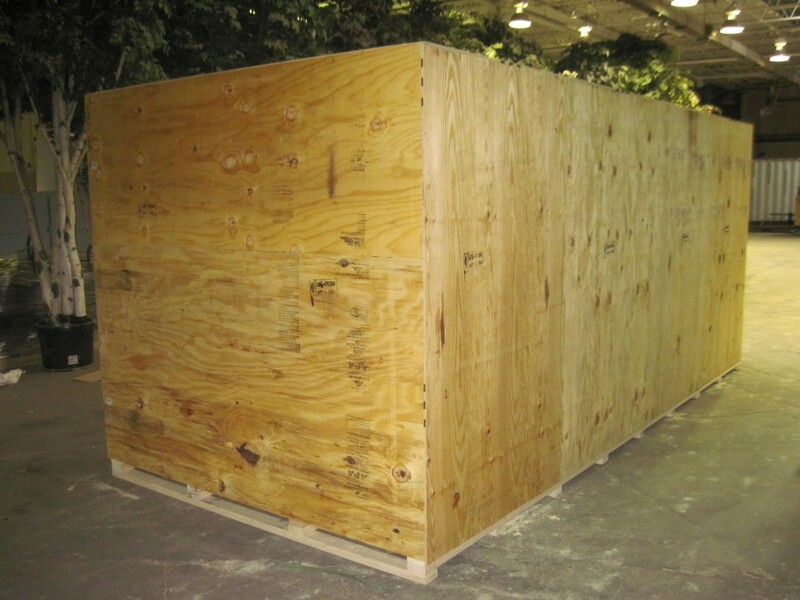 Shipments to certain parts of the world must be fully enclosed in heat-treated wood. 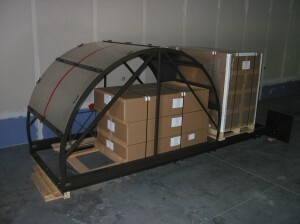 The photo on the left, above, shows a PAST Trainer completely enclosed in a heat-treated wooden crate ready to be airfreighted to Changi Airport, Singapore. 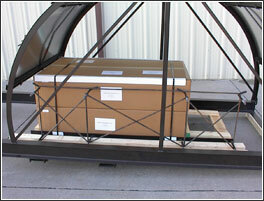 The other photos show a PAST Trainer being loaded onto a freight truck. 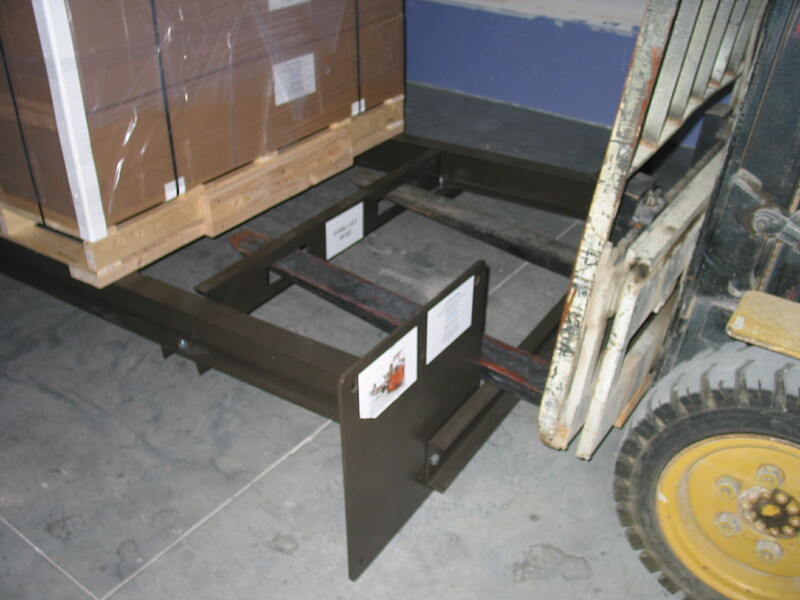 We add temporary steel forklift attachments to the base of the PAST Trainer to facilitate loading and offloading the PAST Trainer. Additionally, it also has permanent forklift attachment on both sides that are designed to facilitate moving and storing the Trainer, as well as positioning it for installation. 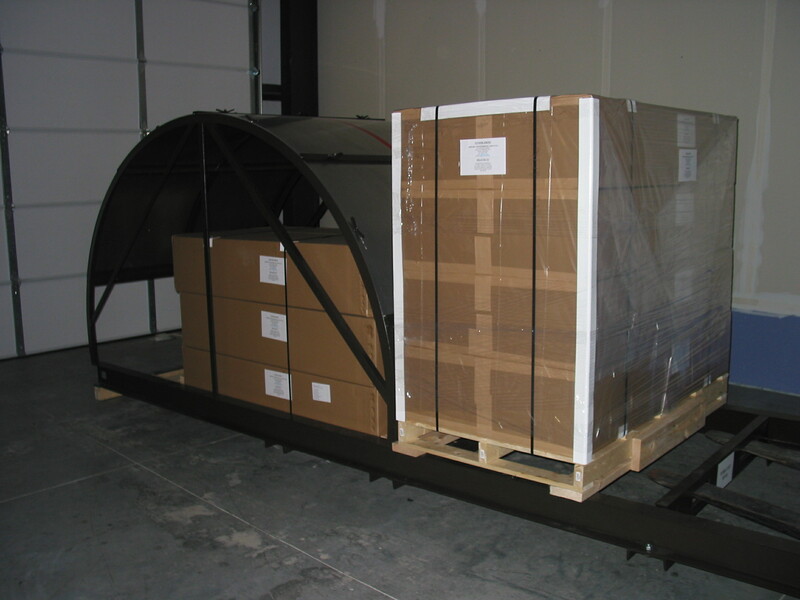 Trainers are shipped to Airport Fire Departments, Air Force Bases, ARFF Training Centers, and Emergency Response Departments in the United States, Canada, and overseas. 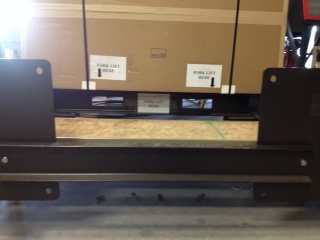 The series of photos below show Trainers configured with different quantities of panel sets. 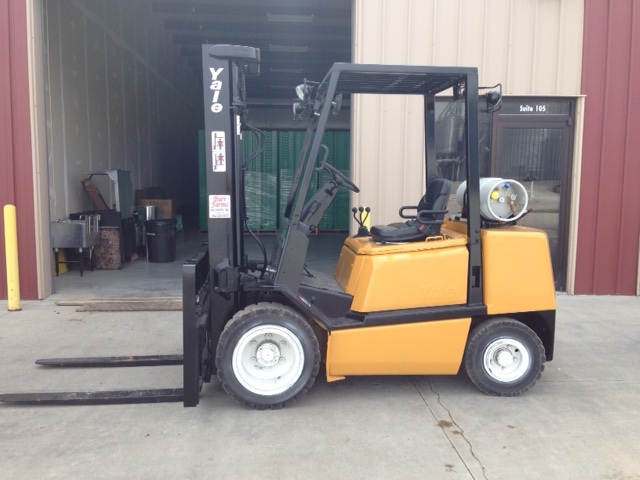 Some of these photos show where the forklift tines engage with the Trainer’s forklift attachment in its base. We manufacture the PAST Trainer and its matching Foundation Anchor System (FAS) using a just-in-time manufacturing process, meaning we manufacture only the specific quantity needed to fulfill known or expected near-term orders. This is necessary because we have limited storage space in our APS Shipping Center to store PAST Trainers because of their large size, and their matching FAS is kept with them. Conversely, we manufacture aluminum panels in very large quantities so we have ample inventory to enable us to react quickly to PAST Owners’ needs for replacement panels. We are able to ship a maximum of five sets of replacement panels (20 panels) secured to a pallet. 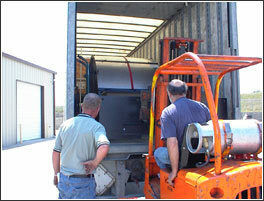 We ship our products on a first come, first served basis. 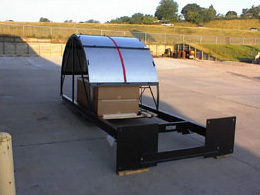 We usually ship PAST Trainers within four to six weeks, and replacement aluminum panels within three to four weeks, after we receive the purchase order. 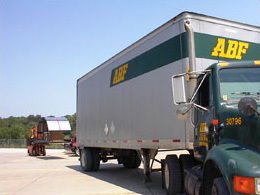 Once shipped, the high quality freight companies that service our shipments typically deliver them within a week to ten days depending on the distance, route, weather, etc. 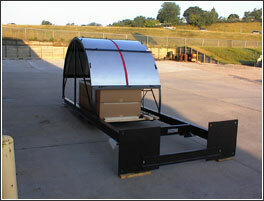 Below is a slide show of PAST Trainer shipment photos.